Hello everyone! This post isn’t as fancy as the one last week, but I sure do love scones and so does my roommate who asks for scones all the time and since I was gone for the entire Winter Break she boldfaced demanded them by the time I came back home. 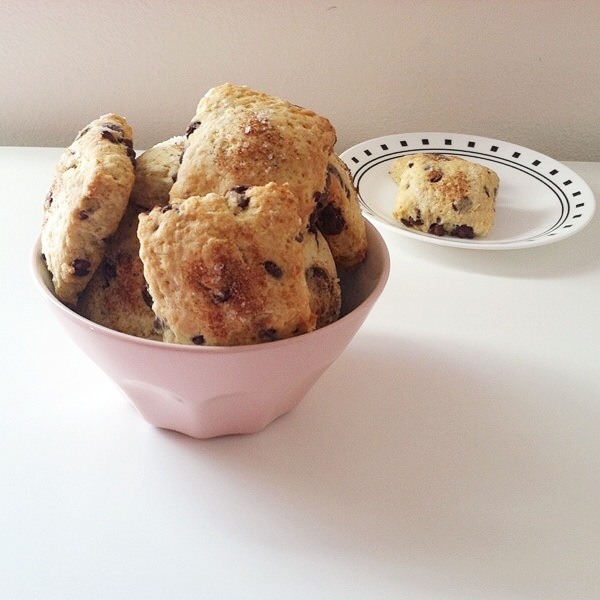 I decided to use fruit and chocolate, once again, to make these scones; there was this lonely banana in our kitchen going way ripe and I decided to use it before it had to be thrown out. I figured with school starting back up a scone would be a nice treat to make since everyone in my apartment chooses sleep over making breakfast (me included), funny enough half of these were gone by nighttime the day I made them! 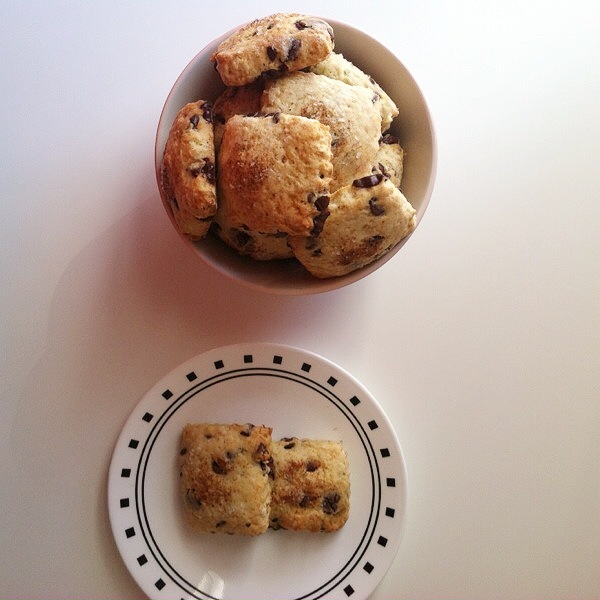 Behind the Scenes (BTS): I obviously love scones that’s no secret and I try not to make the same scone too many times. I remembered the Banana Foster and Chocolate Chip cookie I had made, figured it would be great in a scone as well and boy was it. I really loved that the ripe banana didn’t make it dry and crumbly like your average scone, it was moist and still had a hefty bite to it. There’s definitely enough chocolate in there to get some in every bite and the sweetness of the ripe banana counteracts the bitterness of the semi-sweet chocolate. PERFECT! Break-n-Bake: The reason I made these scones this shape, besides knowing it would be crazy cute for pictures, was that I wanted to see if I could make homemade break-n-bake scones for my roommates when I wasn’t home. The town I’m from isn’t too far away so I like to visit home sometimes if I have a long weekend and no classes. 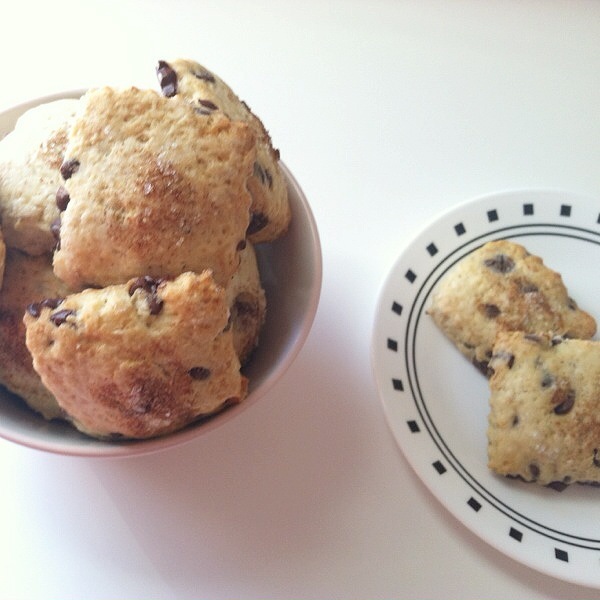 Helpful Hints & Suggestions: Because this recipe included banana it has a lot more moisture than most scones, I would suggest having a floured surface, not too much just a sprinkle, to make sure nothing sticks. Also if chocolate isn’t your thing or your not in the mood for it walnuts are a great substitution. Switch out the 1 cup/160 grams of chocolate chips for 1 cup/160 grams of walnuts, but just like the chocolate make sure to roll the walnuts in the flour mixture before adding the wet ingredients. P.S. I’m going to start adding downloadable recipe links that way if you want to print the recipe you won’t get my whole blabbing post just the recipe. After measuring out all of your ingredients, sift into a large bowl your flour, sugar, baking powder and salt. In a small bowl or cup combine your milk, egg, and banana. Stir until the banana is completely emulsified into the liquid mixture. 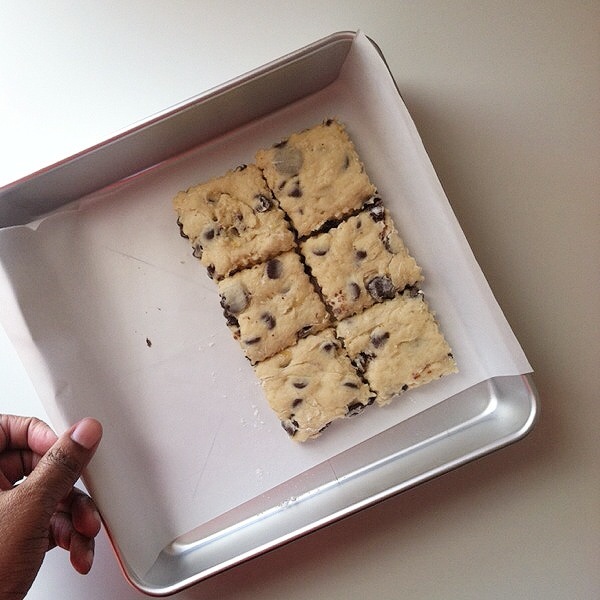 Add the chocolate chips to your dry ingredients and start to crumble your butter into your flour mixture; when the butter is the size of peas and the flour mixture is coarse add the liquid ingredients. Mix all the ingredients until combined. If you want the look I have here on the blog then roll out your scones on a floured surface and using whatever cookie cutter you prefer cut out your shapes. 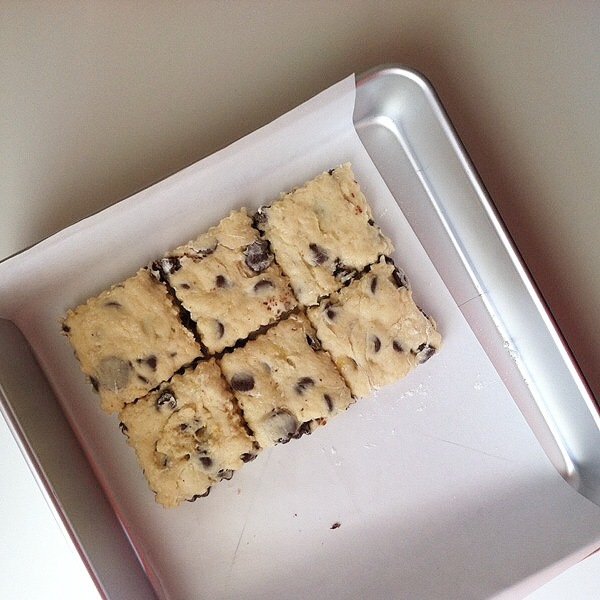 |press thoroughly through the dough because the chocolate chips won’t go down easily|If you want to do it the regular triangle way then roll your dough into a flattened circle and cut your dough in half, then into fourths and the into eights. They should look like 8 little triangles. 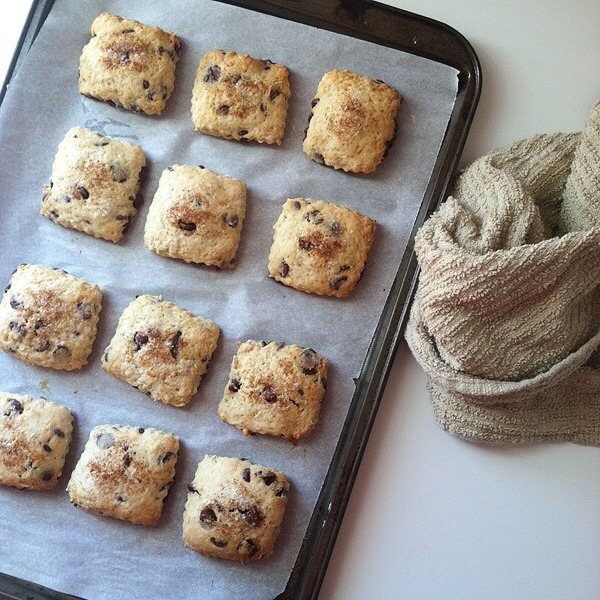 When you’ve reached your desired shape of your scones, lay them out on your sheet pan that has been lined with parchment paper, aluminum foil or your silicon mat. 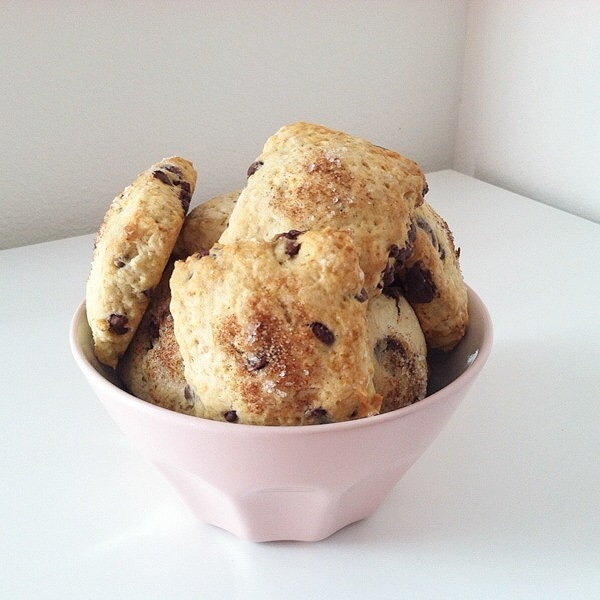 Brush your scones with some heavy cream (milk will do as well) and sprinkle some cinnamon sugar onto the scones. Use cinnamon powder and granulated sugar and TADA you have cinnamon sugar. 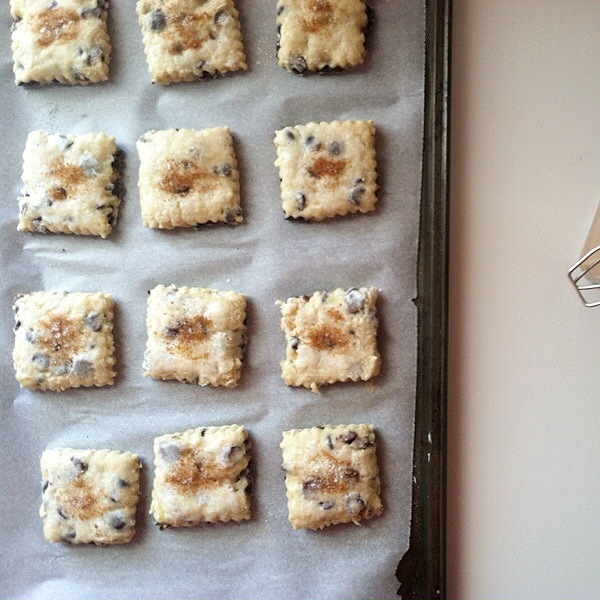 I usually like to add a sprinkle of sea salt as well onto all my sweet things; I love the even taste it gives to sweet. 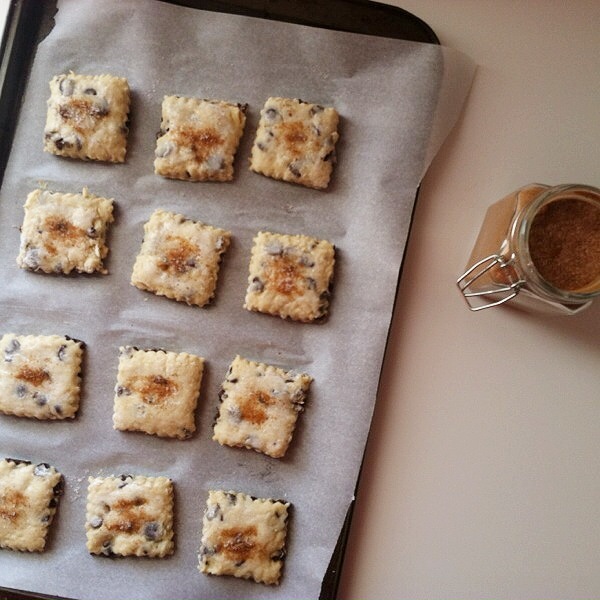 Use a fine sea salt, you can find this at any supermarket, and sprinkle no more than a pinch on each scone. 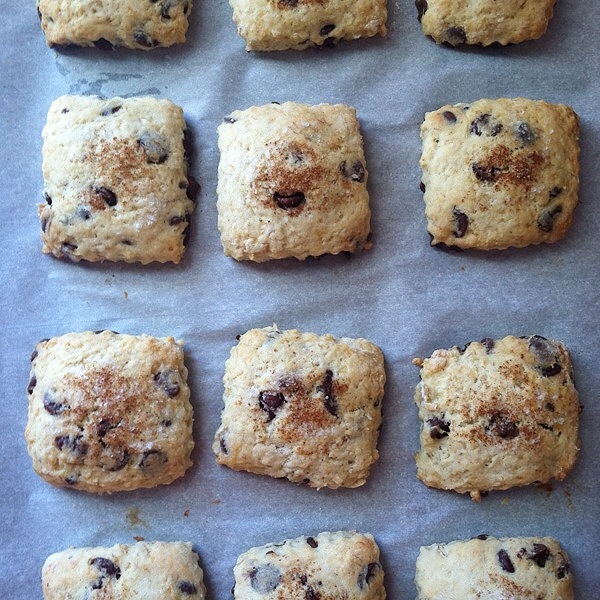 Put your scones in a preheated 375F oven for 20 minutes. Let them cool down and enjoy with milk, jam or by themselves.